I ordered four Peripera nail polishes off ebay a few weeks back and they arrived last week. The four I got were Metallic Green, Crystal Gold, Crystal Beige and Crystal Brown. Metallic Green was the only one I had seen swatches of (over on Pretty Random), the other three I just bought from the colour chart on the ebay listing - which means they were pretty much a stab in the dark. 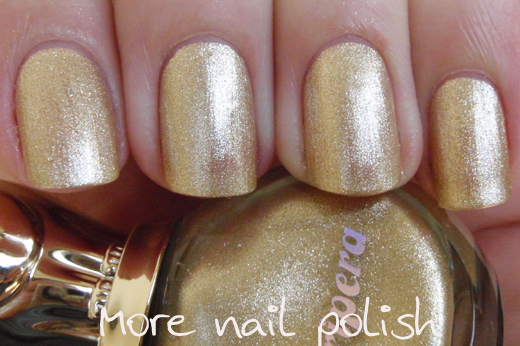 If you don't know of Peripera nail polish, here's the low down. They are a Korean brand with georgous round bottles with little metallic gold cats as the handles. They also have a Rose range, which feature very long handles with rose motifs on them, but I haven't tried those. Today's polish is from the Perfume range (the cat bottles) in Crystal Gold P024. These cat handles have the extra wide brush, which I have to say is really growing on me now. They also are scented when the polish is dry. I know a lot of girls hate the smell, but I actually quite like it. Except as Carly pointed out when she reviewed the Revlon scented nail polish, you don't want to be caught sniffing your fingers in public as it "makes you look like you have just picked at your bum and need to smell to see if you scratched a bit too far in". Girl you had me rolling on the floor with that line! Anyway, back to this polish. I love gold polish, and this one is right up there. It's a cool toned gold, which is preference too. This was two coats, no top coat. A fabulous golden metallic foil. This is what it looks like indoors, which is still beautiful. Of course I have quite the selection of gold metallic foil polishes, so I went through my swatch sticks to find the three closest colours and finish matches. Here they are in the sun. So even with my massive gold collection, I still didn't find an EXACT dupe, but that's just because I can see even the tiniest difference in colours! This was two coats, in the the comp pic it was two coats of all of them. How long does the smell last? I always wonder that! Lovely!! 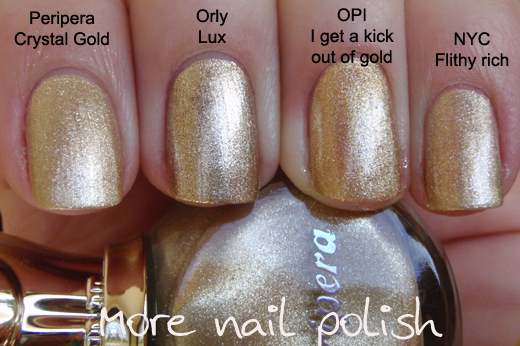 And I love gold and silver foil polishes!!! Tina - will take a bottle shot of them today. Fingers - I only wore this polish for one day, but it was smelly for the whole time. I wore the metallic green for two days, and still smelly! I like the foil look. To me the NYC polish looks most similar! But still not a dead on match! Absolutely gorgeous! Do you think this would be any good for stamping?